SB 674 – Expedited licensing process for certain psychiatrists – Public Hearing on 3/1/17 8:00 a.m.
Click here for the video link to the hearing. SB 674 Schwertner | et al. Relating to an expedited licensing process for certain physicians specializing in psychiatry; authorizing a fee. According to the Austin American-Statesman today, Governor Greg Abbott ordered a freeze on state hiring until the end of August, 2017. Under the terms of the freeze, no agency should post a new position or fill a vacated one, and savings should not be used for other purposes. What does this mean to you if you’re a prospective applicant (physician, PA, acupuncturist or surgical assistant)? That things will be slowing down at TMB because they have several vacancies in the Licensing Department. And things will only get slower once the onslaught of physician in training applicants hits the Licensing Department (usually begins in March to April and lasts through mid-July) and all of the other applicants who complete training programs in June begin to file their applications for full licensure. Yikes! So get your application filed as soon as you can and work to complete the documentation requirements as quickly as you can. Initially I was shocked to learn of Mari’s resignation as were many physicians who were lighting up the Garanflo and Meyer phones. Also, the Texas Medical Board was headed into Sunset hearings before the 2017 Texas Legislative session and the Teladoc lawsuit had still not been resolved – BUT, the more I thought about it the more it made sense. There is probably not anyone in the state of Texas that knows more about how Telemedicine should look in Texas and heading up UTMB Gavleston’s Telehealth program is a good fit. Jaime and I wish Mari the best and know that she will work hard to make UTMB’s program the best in the state. Oh the phones!!!!!!!!!!!!!!! Texas Medical Board – Ugh! I think today was a record for me in trying to reach the Texas Medical Board and specifically CAR. I began dialing using two phones at 8 a.m. – after about 250+ redials I got through to the message that all lines are busy – this happened around 9:15 a.m. and still now at 9:55 a.m. I continue to be on hold. I have some answers on how to fix this issue – but alas I just connected with staff at 9:58 a.m. – UGH! Recently we received a phone call from another licensure consulting company asking for our help in getting an applicant through licensure – I wanted to laugh, but didn’t and gave the young lady a few hints on when to call, how to send things, etc. but I ended our conversation by telling her that we, G&M are not miracle workers. Now we are pretty darn good at getting things through CAR at the Texas Medical Board but even we can’t overcome 3000 pieces of mail, emails that are over 45 days old, mail that even when it gets to an applicant’s file in CAR may sit for 2-3 weeks. 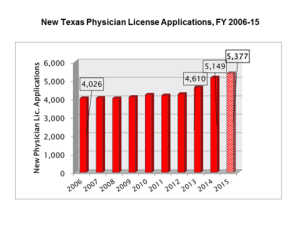 I don’t think anyone could have imagined that adding the four license types that Senator Nelson and the Texas legislature did in 2015 would have this kind of effect – but it has truly crippled physician licensure. The only remedy that I see is a complete reorganization. Oh the numbers are HUGE! TMB Physician application numbers out of sight! Have you tried to call the medical board and speak to someone about your license application or maybe you just have a question about how to get a license – WELL, they have been one super busy staff. Fiscal year 2015 saw 5.377 physicians apply – a new record! So, having said that if you are planning to apply anytime in the future you might want to contact us to help with your process – not only do we know the process most of it we are responsible for – and that can be good or bad, depending on your point of view. 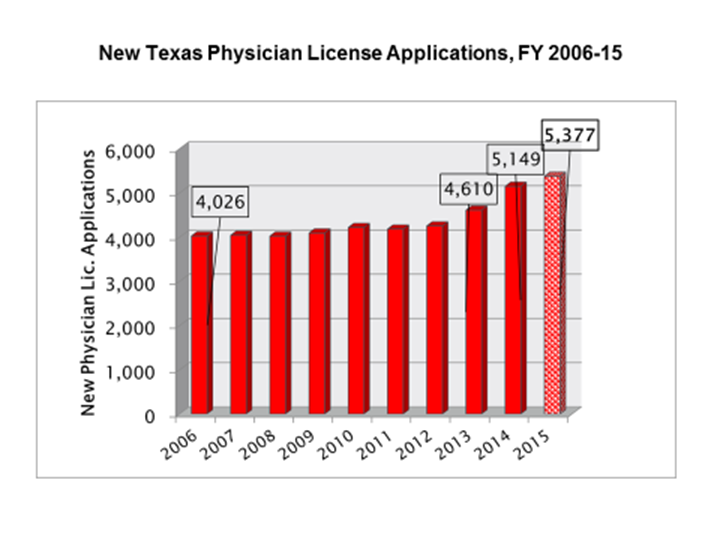 Graph provided by the Texas Medical Association. More and more and more – Physician applications exploding! ALLEGATION: Texas is not adding physicians in rural Texas any faster than we were during the liability crisis years. Rural Texas was losing physicians per population during the liability crisis years. Today, those numbers are on the upswing. Since the passage of reforms, fifty-nine rural counties have added at least one emergency medicine physician. Thirty-one rural counties have added an obstetrician. Twenty-four rural counties have added a cardiologist and seven have added an orthopedic surgeon. The rural gains are not simply a bi-product of population growth. For instance, forty rural counties that did not have a single emergency medicine physician in 2003 now do. Fifteen rural counties that lacked a cardiologist and thirteen counties that lacked an obstetrician now have one. Take the time to read the entire article. The 2015 Texas Legislature is now one for the books. Some bills passing will be a huge benefit to physicians in Texas, some of the bills are just okay and sadly others never seemed to make it off the ground floor. One of the best bills adds significant funding for GME – with new medical schools in Texas coming online very soon the only way to keep those Texas educated docs in the state was to increase funding and luckily the legislature agreed. Another plus will happen in September 2016 when the DPS Controlled Substance registration will go bye bye. I am sure that everyone will agree that it takes long enough to get a state license and then to have to wait on the DPS registration was just a bit much. See Senate Bill 195 for more info. On the not so okay side the bills to establish an interstate compact much like the nurses made it out of the House but never saw daylight in the Senate – this would have been a huge plus for physicians who are more mobile than ever. And once again the session saw an exam attempts bill presented only to meet its death. To be honest the 84th session actually started over a month ago – but things are finally heating up with the House committee appointments finally in place. Bills are being filed and some might be of special interest to the physician community. One bill that is of great interest to me is SB 190, Interstate Medical Licensure Compact. This is a long overdue regulation – the only issue is getting all other state medical boards to sign up. HB179 addresses some concerns of physicians who have had a complaint lodged against with the board – this bill will require the board to provide the physician with “specific allegations” in regard to the complaint. HB1508 provides reciprocity for certain physicians who are board certified in certain primary care specialties. We’ll keep you posted as the session goes on – it’s gonna be a crazy session.